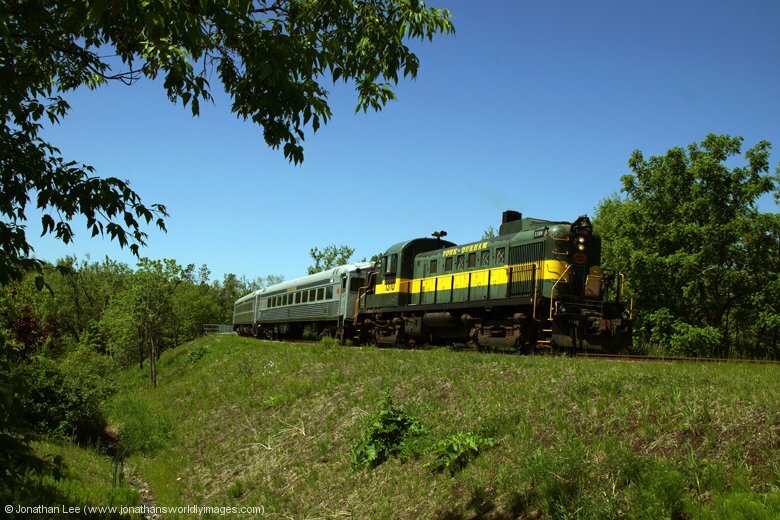 This trip was planned around the main event, which was a week in Springdale, Arkansas in the US for the National Railroad Historical Society annual convention. 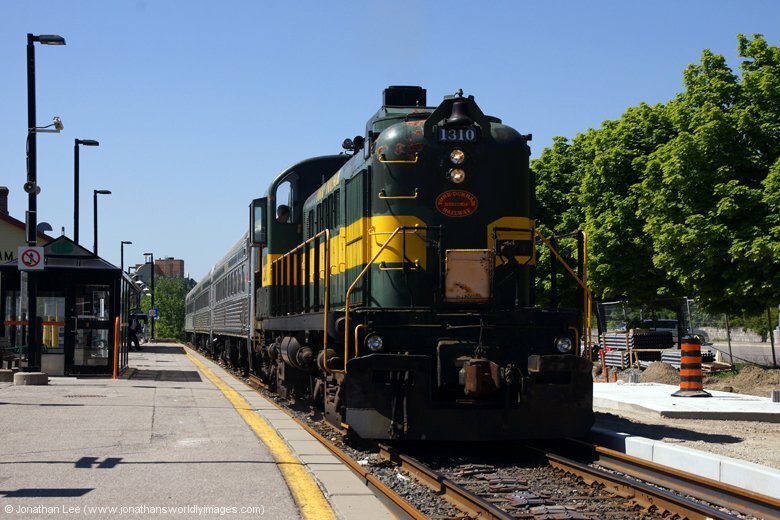 It was a bonus that the York Durham Heritage Railway would be providing shuttle services on the GO Transit network with their heritage stock only the weekend before! A plan was duly hatched to fly into Toronto and then travel overland from Toronto to Springdale…..
A 30 minute walk, straight down the main road from Stouffville GO station. The only issue we had when checking in was the fact that the bill said $109 and not the $89 I’d been quoted when booking the room over the phone; that was soon rectified with a call to the hotel manager and the room we were given was large, clean, had AC, fridge and microwave and two queen beds. A 10 minute walk from London VIA station. The room was a decent sized one and had two queen beds, with AC, fridge, microwave and TV. Thankfully though the earplugs drowned out the noise the giggling girls were making in the next room and I didn’t need to go round and knock on their door before attempting sleep! Tickets purchased at the departure station; note that day passes are effectively a return between two stations and valid between the two all day! Purchased through VIA’s website during a 50% off sale! As the taxi pulled out of my street at just after 0615 I realised at that point that a long journey lay ahead of us and after we’d picked Vic up from his front door the long journey to Stouffville, Ontario really began. Our East Coast train to London was the 0654 from Doncaster and in the capable hands of 91107 for the excellent run up the East Coast and we were deposited into Kings Cross bang on time; having got off a rather empty train for a commuter train to London. The Piccadilly line to Heathrow was running ok and after the central London stops seats became available for the rest of the journey; which took the usual hour and cost £5 on the Oyster card. It was at Heathrow though where Air Canada seemed to make everything a little harder than it needed to be. As I was hand luggage only there wasn’t an issue but for those that had already checked in but had a bag to check-in life was made a little harder and in fact it would have been quicker to queue in the check-in queue than it was to have gone to the self-service check-in kiosks to go through the same rigmarole that you’d already done at home, only to be able to print out your own baggage tag and then queue again to drop it off, yet still have to hand over your passport to do so! And what was more Vic couldn’t actually print his baggage tag without me scanning my passport in as we were on the same booking; had I actually gone through on my own, to meet him on the other side, he would have had to queue in the check-in queue anyway, completely and utterly defeating the object of on-line check-in! Farce over we were soon through security and spending a pretty penny at the Bridge Bar for breakfast; where it actually took the staff 10 minutes to take our order once we were seated. I was on the verge of walking out by the time they did take it! Still it was ok when it turned up. The one bit of efficiency that Air Canada did get right was the fact that there was no messing about when boarding the plane, the gate was put on the screen, passports and boarding cards were checked at the gate entrance and you were straight down the ramp onto the plane. However the efficiency was undone by a broken down tractor unit that couldn’t push our plane off the stand. Try as the Captain might though the airport wouldn’t use another one and the one already attached to the plane had to be fixed, resulting in a 1 hour late departure; us having been sat on the plane for 1h40m before we backed off the stand. Things only went downhill from that point on as we entered the air due to us being surrounded by children, front, back and side, all of which screamed the place down at some point. To sum that up it was f***ing crap and something I definitely didn’t want to ever have to endure again for 8 hours. Unfortunately the noise couldn’t be drowned out by the plane’s on-board entertainment system as it was buggered and had to be reset on three different occasions. After all that we were only 25 late landing into Toronto but there was one last annoyance to be thrown at us before we left the airport, which didn’t really affect me with my hand luggage; the bags didn’t make it onto the luggage carousel until 25 minutes after we presented ourselves at it! To get to Toronto Union we used the TTC run “Airport Rocket”, bus No. 192, which departs from a stand downstairs from the arrivals hall. They run less than every 10 minutes during the day and tickets cost $3 each, which includes transfer to the TTC Subway at Kipling. Tickets can be bought from the driver, but only with the correct change; there’s money changing machine just inside the terminal doors near the bus stop. The transfer from bus to subway at Kipling is ticketless and you don’t need any other ticket from that point to the point you exit the subway; just simply go down the stairs, get on the next subway and change where you need to. The change at St George from one line to the other is straight up the stairs off the Kipling line. Stouffville, Ontario was a whole lot nearer now than it had been when we were leaving Doncaster, although to the body clock it was almost 2300 and not almost 1800 as the local time was in Toronto. As it was the back end of the rush hour queues for tickets were quite long and it took us 10 minutes to get ourselves a single to Stouffville from one of the GO Transit ticket machines on the concourse; still we had plenty of time before the 1800 Lincolnville so there wasn’t any reason to flap. 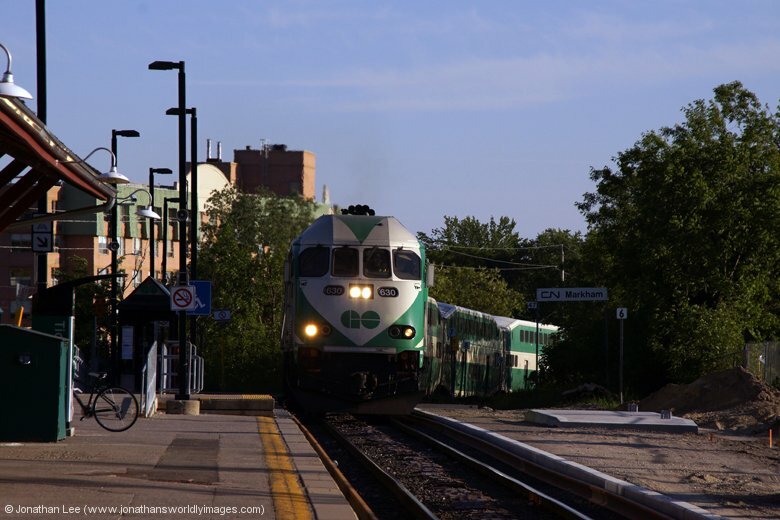 As with all GO Transit operated lines, other than the Lake Shore Line, the Stouffville Line only operates commuter trains, in for the morning commute and out for the evening commute. 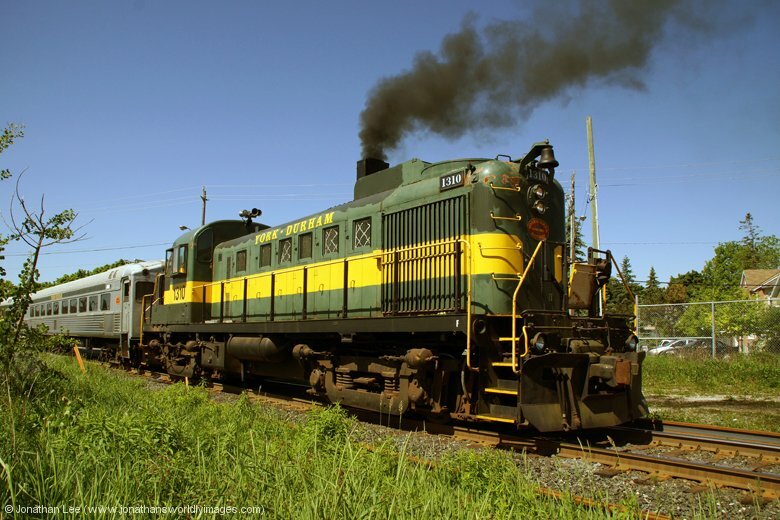 Of the 6 that ran to Lincolnville in the evening there were only 3 left to go so we opted to do the 1800 to Markham, mainly just to see where we’d be going the following day, for the 1830 behind it to Stouffville; the next one being 1910 and 40 minutes behind it anyway. 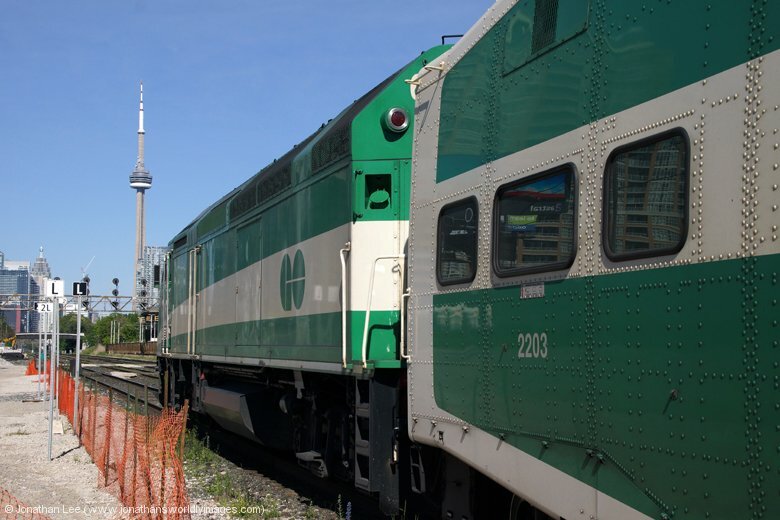 Both trains were worked by GO Transit MPI MP40H-3C’s; #607 & #630 respectively. It was a nice evening and the 30 minute walk, straight down the main road to the Stouffville Inn was pleasant, if not a long walk. The only issue we had when checking in was the fact that the bill said $109 and not the $89 I’d been quoted when booking the room over the phone; that was soon rectified with a call to the hotel manager and the room we were given was large, clean, had AC, fridge and microwave and two queen beds. We wasted no time at all in going to find somewhere to eat and right by the hotel was a group of shops, where all the kinds of food you’d want were being served. There was an Indian, a Chinese, a Greek place, a Pizza place and a Thai place; we opted for the latter and pigged out on quite decent Thai food, although there was no beer available as the manager had apparently run out of money to buy any……. By the time we got to bed it was only 2200 but of course 0300 to our body clock’s; neither of us felt jet-lagged though and sleep came very easily that night. Having made the decision to get up at 0815 and do the 0936 GO Transit bus to Markham we actually ended up on the 0906 bus instead, having still been into Tim Horton’s for breakfast. Thankfully we’d spotted a No. 71C bus going past us the previous evening when we were walking down to the hotel; this saved us the 30 minute walk back to the station that morning! The fare was $5.70 single and we bought the tickets from the driver as we boarded the bus, thankfully not having to already be in possession of a ticket before boarding. 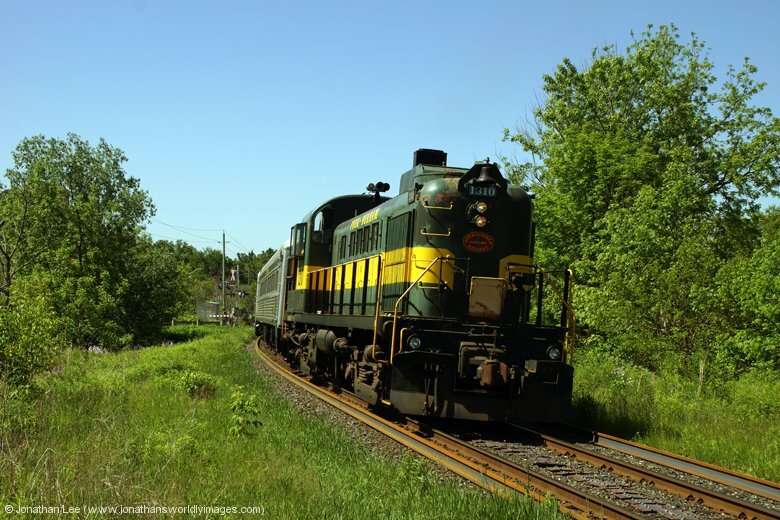 The whole idea behind the day’s plan was to do a few trips from Markham to the Old Unionville station whilst enjoying some good old Alco thrash, as provided by the York Durham Heritage Railway (YDHR), based in Uxbridge. As it was Unionville festival the YDHR were providing train rides from Unionville to Markham and return, for the bargain price of $8, and with T&T Alco’s to boot. As the Old Unionville statin was a good hike from the GO Unionville station we decided to get off the bus at Markham, photograph the empties running through to Unionville and then photograph the first train coming back into Markham. It was a glorious morning and the empties didn’t turn up until almost 1100, which wasn’t so good as the first train back from Unionville was at 1100! What’s more we were both at a loss for words when the train came round the corner with a cab car leading and Alco RS3 #1310 on the rear. The obvious question being where the hell was the second engine; unfortunately a question we didn’t manage to get answered due to an unfortunate turn of events in the not too distant future, at that point in the day! Completely flabbergasted by the consist that had rolled into Markham, stopped, and then departed for Unionville empties anyway, we spent the whole time it took it to get to Unionville and back speculating why there was only one engine on the train and having photographed the train arriving back into Markham with the first passenger carrying train of the day we managed to get back to the station and purchase our $8 ticket, valid for the whole day, and clamber aboard. There were seats in the coach next to the RS3, right at the very rear, next to it, where we set up camp next to the #1310, not realizing just how short-lived our camp would be……. The run downhill towards Old Unionville was a bit of a totter and we suspected the run back up to Markham wouldn’t be much different but at least expected the RS3 to have to do some work going up the hill. Unfortunately the whole thing was a massive disappointment; we’d even managed to blag our way into the old driving cab of the front coach, only to be greeted with 20mph running and nothing above notch 3 thrash all the way. 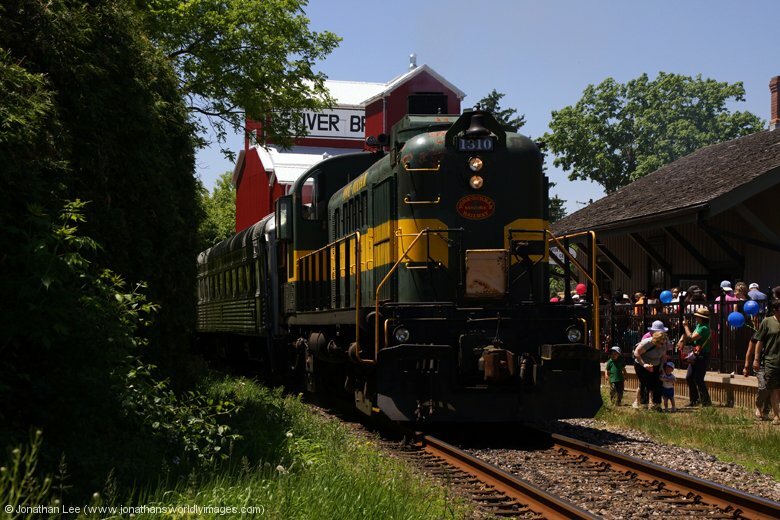 Upon arrival back at Old Unionville, on trip number two, we were given the bad news as we exited the train; the #1310 had developed a fuel leak and the next train back to Markham would be the last run of the day and the set would then be heading back to Uxbridge, end of day! This gen was soon confirmed by the YDHR’s Ron Layton, who I’d been conversing with before we’d left the UK. 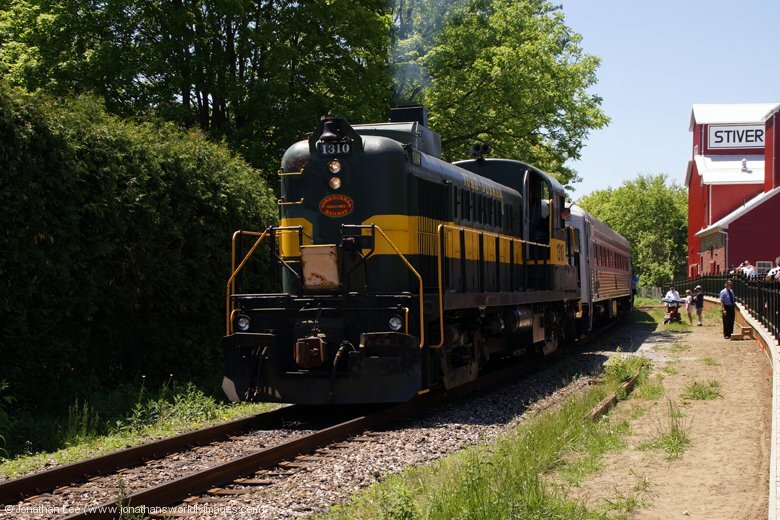 He also told us that due to the time it would take to get back to Uxbridge it wouldn’t even be worth trying to quickly swap out the engine and return as the day’s festivities would already be over. Having got the photographs we wanted before returning to Markham on the last trip we were soon withered again as the train departed at 1255 without having boarded anyone from the queue at the station. Ron confirmed that people already on the train that were wanting to return to Markham had been allowed to stay on and go back but nobody had been boarded from the queue! As a result of that we ended up being given directions to get to the Unionville GO station and it took us about 20 minutes to get there. As we were walking down the approach road to the statin the late running 1310 bus to Toronto Union turned up and we boarded, paying the driver $7.20 for the non-stop journey to Union. 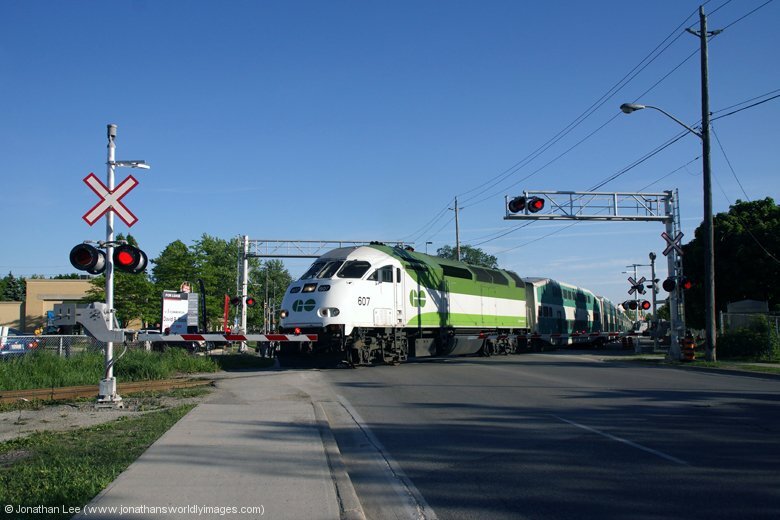 Once at Union the only option for cranking was on GO Transit’s LakeShore line with there being options to Exhibition on the Aldershot line in one direction and Danforth on the Oshawa line in the other direction; trains crossing at Toronto Union and being a plus 3 in either direction. As Exhibition was in the same zone as Toronto Union we decided upon a day pass to Exhibition, which cost $10.40, a single being $5.20. It didn’t turn out to be the best move as trains coming in from Aldershot were all late and we only actually made one of the plus three’s at Toronto Union! Everything coming in from Oshawa was bang on-time into Union but with the eastbound trains being late some of the plus 4’s at Danforth may well have been a bit dodgy. Despite only making one of the plus 3’s at Union we ended up getting 8 of the 10 locos out on the Lake Shore circuit in and could have had the remaining two but we didn’t want to tempt fate with a plus 25 for our VIA train to London so had to settle for 6 new from 8. Trains were well loaded both from Union and into Exhibition from the Aldershot end, outbound being one set of fans going home after a game and inbound being a different set of fans heading to a football match at the stadium outside Exhibition station. Not wanting to engage in more fast food eating that evening we managed to find a rather nice Mexican fast food establishment called Chipotle, out of Union and to the left, which provided us with a decent meal before we had to find the boarding gate for our VIA train to London; and have our boarding cards ready for inspection as the train was being boarded; to me and you that would be had our tickets ready for inspection as we headed to the correct platform for our train to depart from. If VIA spent more time trying to run trains on a railway and not trying to imitate an airline then they wouldn’t be cutting back trains left right and centre! The good thing about VIA trains is the free Wi-Fi, even in ham class….. The journey to London went without issue and we were even treated to a new VIA GE P32 #919 for our efforts. Our hotel for the night, the Holiday Inn Express, was only a 10 minute walk from London station and no sooner had we checked in were we heading straight back out of the door and to the Milo’s Beer Emporium; which only had about 20 beers on tap and two hand-pulled as well! As it was almost 2200 when we arrived we only stayed for two and then headed straight back to the hotel for some needed sleep. The hotel room was another decent sized one and also had two queen beds, with AC, fridge, microwave and TV. Thankfully though the earplugs drowned out the noise the giggling girls were making in the next room and I didn’t need to go round and knock on their door before attempting sleep! 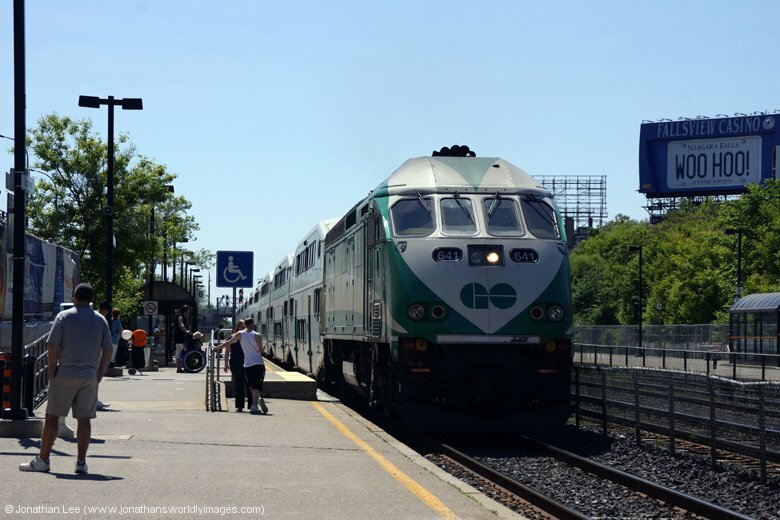 600 & 607 both in Toronto Union with spare sets – maybe for additional trains after the games if required? Breakfast in the Holiday Inn was decent and plentiful. We were out by 0925 and waiting at London station for our VIA train 71 to Windsor, which the departure screen was showing 5 late; it actually arrived 7 early; cracking gen there VIA just you keep trying to operate like and airline and you can get away with poor advertising of arrivals like that! Having only had 4 VIA Genesis units before we were slightly disappointed when a dud #917 turned up. The journey to Windsor was simple enough and we were only a couple of minutes late arriving. From Windsor we were heading straight over the border to the USA in Detroit and we only spent 15 minutes in Windsor before heading out of the city towards the USA. There were taxi’s outside Windsor station and the journey to the Windsor Transportation Centre, or bus station as it actually was, only took 5 minutes, the taxi fare being $8.70 on the meter. This dropped us into the 1200 Tunnel Bus, operated by Transit Windsor, tickets for which cost $4.50 in either US or Canadian and can be bought in the ticket office at Windsor or on the bus, with correct change only. And into the USA we went…….